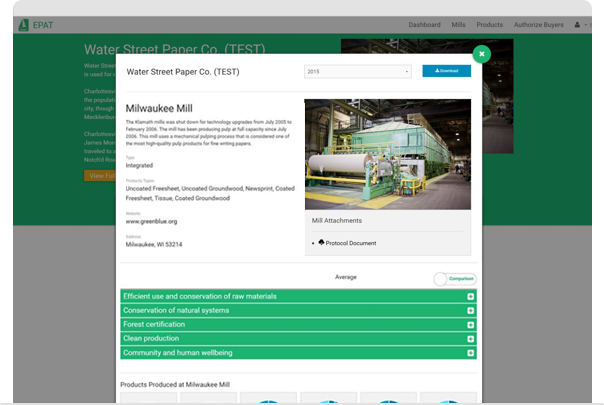 An innovative platform for buyers and suppliers of paper products to share supply chain data and facilitate discussions on sustainable paper procurement. Easy ­to ­use supply chain visibility tool that provides insight into the most important key performance indicators for environmental performance. Easily find mills in your supply chain and use credible data to answer important sustainability questions. 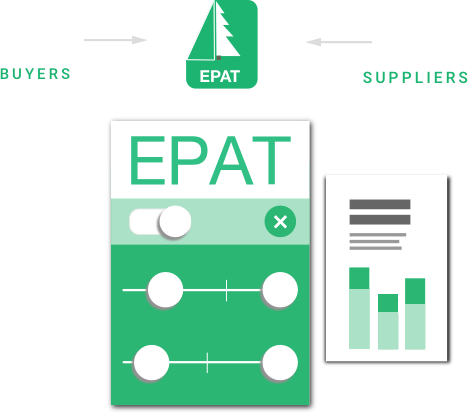 Use the EPAT platform to learn more about the key considerations any company should make when evaluating environmental performance of paper products including forest certification, recycled content, energy and water use, and more! Be a part of the EPAT community in our quarterly roundtable webinars, newsletters, and other ways to participate. Save countless hours on sustainability scorecards by using a platform already populated with sustainability data of leading manufacturers in North America, Europe, and Asia. New in EPAT 3.0 is the ability for suppliers to conduct internal benchmarking to see how your mill performs against industry peers for over 20 key performance indicators. Reach new buyers by showcasing your environmental performance to clients interested in sourcing sustainable fiber products. Conduct internal benchmarking to evaluate your mill performance against industry peers. Demonstrate your commitment to sustainability by providing buyers with easy-to-access information on all of your most relevant sustainability indicators. Quickly create, post and manage an online mill profile showcasing your data. CAN OTHER USERS VIEW MY DATA? As a supplier, the only users who can view your data are the buyers who you have authorized. Suppliers cannot view each other's data. HOW SECURE IS THE EPAT WEBSITE? EPAT data resides on a secured EPAT database. EPAT data is stored by a professional, experienced web­hosting company and includes firewall protection, data encryption and all relevant security measures. HOW DO I KNOW THE INFORMATION IS CREDIBLE? Suppliers are required to indicate whether a reported indicator has been publically reported and/or verified by a credible third­party. Buyers are able to see for each indicator if it has been publically reported and/or verified by a credible third­party. Have additional questions about EPAT? Feel free to contact us!